The Omaha Symphony’s annual “Symphony Spooktacular” is officially my family’s kick off to Halloween each year. Held about a week or so before Halloween , it’s a kid-friendly concert with pre-show activities (such as my kids’ favorite, instrument petting zoo) and orchestra members dressed in goofy costumes. It’s about an hour-long concert – the perfect length – and once it’s over, kids trick-or-treat in the lobby. Now how’s that for a symphony outing? We all enjoy it. The kids get to dress up. We all get to hear good music. It’s a tradition now. The 2015 “Symphony Spooktacular” is Sunday, Oct. 25, at the kid-friendly time of 2 p.m. If you want to go this year, read on for a special giveaway! Costume contest among the musicians. This is a fun one. You kinda expect professional musicians to be serious, but at this concert (at all family concerts, actually), they let loose and have some fun. My favorites are always the group costumes. Special guests. In past shows, we saw martial arts students perform, a magician, “Star Wars” characters and more! Surprises. There’s always a surprise. When: Sunday, Oct. 25, 2 p.m. Cost: $12 (everyone must have a ticket). Get your tickets here. Tip: Seats are general admission, so get there early to snag good seats, then go explore the pre-show activities. 1. Leave a comment: Tell me what would be the funniest group costume of 2015. What would your family dress up as? 2. Share it on Facebook: Share this post on Facebook. 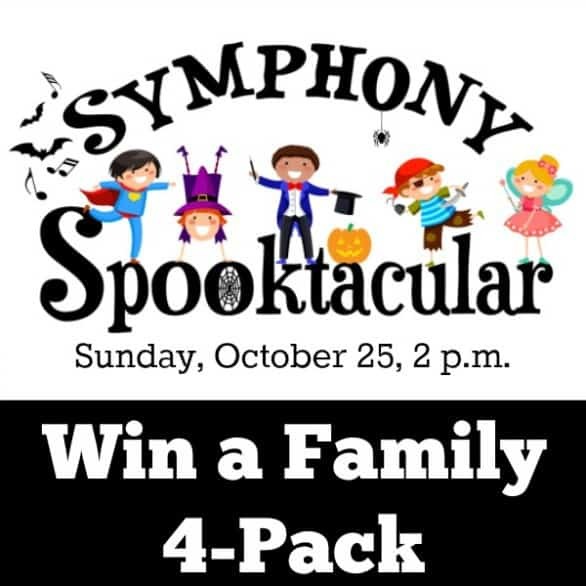 Here’s an example of what you could writer: Enter to win a family four-pack to the Omaha Symphony’s “Symphony Spooktacular”! http://wp.me/p3qlLN-1IV. Once you share it, come back here and post a comment that you did and share the link. Due to privacy settings, I probably won’t be able to see your post, but I trust you guys. Honor system. 3. Share it on Twitter. Tweet this: Enter to win tickets to @omahasymphony Symphony Spootacular via @ohmyomaha http://wp.me/p3qlLN-1IV. Come back here and leave a comment with a link to the tweet. Please make separate comments so it’s easier for me to track each entry! The nitty gritty: Giveaway ends Oct. 18 at 11:59 p.m. Must be 18 years or older to enter. Winner will be randomly drawn using Random.org. Winner will be contacted via email within 48 hours of the end of the giveaway, and will have 48 hours to respond to receive details on how to get the tickets. Disclaimer: Thanks to the Omaha Symphony for providing the family four-pack of tickets for this giveaway. The Omaha Symphony also provided a complimentary four-pack of tickets for my family to attend the “Symphony Spooktacular” as well. My coworkers and I are going to dress up as the 7 dwarfs. I just shared the post on Facebook. I don’t know about funny, but my son wants us to be dogs from Paw Patrol. I just shared on facebook. This looks like so much fun. My kids would love it. My son wants the family to dress up as Pac Man & ghosts. We would absolutely love to go to this. My husband has the day off and it would be a perfect family event for us! I suggested a “cops and robber” theme to my neighbors who always so a group costume. The 4 big kids can be officers and the newborn can be the robber and be pulled in the patty (little red) wagon. Shared on FB- hoping to win! I think Despicable Me characters would be a fun group costume! Looks like a great event. Shared! We went as characters from Little Red Riding Hood. I was the Grandma, my husband was the Big Bad Wolf, and my youngest was Little Red. This year they want to go as characters from Descendants or Star Wars. Last year, my staff & I dressed up as Minions!! My assistant was Gru! It was so fun!! Lots of laughs that day! It would be fun to dress up like Veggie Tales – all vegetables! Shared on fb. not sure how to share the link. Last year my husband a bee keeper, my son was a bee, my daughter a flower, and I was the bee hive! I think it would be fun to see the characters from Inside Out. We are tentatively going as cop/robbers! Shared the link on Facebook as well! A family of Ghost Busters. Everyone could pretend to fight ghosts all night long. I just shared it on FB and I will be waiting for the email message. My girls are dressing up as princesses as this is their first official Halloween (with full costumes). I have not yet decided if I am going to join them. The kids would love to dress as minions. I think it would be funny to see a group costume as the characters from the new Inside Out movie! My kids are dressing up as Minions this year, and my husband and I are still try to piece together costumes to go along with them. My coworkers and I dressed up as Cruella De Vil and four of the 101 dalmatians. I don’t know about funny, but would love for my kid to be a bag of jelly beans. Or as a family, we could do some Sarah and Duck characters. I don’t think I can peel her away from Elsa! Momma bear and cubs chasing a hiker. We have always talked about going as Star Wars characters or the Characters from the Despicable Me movies. We love the Symphony Spooktacular, but haven’t been in a number of years.